Browse: Home / 2012 / July / 01 / Three Restaurants I Love. A celebratory dinner, happy hour on Wednesday and breakfast Sunday morning. I have been a foodie from birth! Family stories include me waking up early to prepare weekend fruit trays at the age of 7. Not sure if I should have been wielding a knife unsupervised, but I was in the kitchen and a happy camper. When it comes to food, not only is it about taste, texture and presentation, but your dining companion(s), and tonight let’s go out on the town and into someone else’s kitchen. A good place to be. First, let’s discuss Spinasse. I went there for a birthday a few years ago (before they expanded and added Artusi), and it was love. The house made pasta with sage butter is so simple and exquisite, it makes me tear up with joy just thinking of it. The food is always impeccable, as is the service, plate presentation, flavors, and ambience. It’s all done just right. Simple but upscale, interesting but not overworked. Since that first night, I’ve tried to share Spinasse with everyone I can. My boyfriend and I gave our friends a gift certificate to Spinasse as a wedding present. We knew they’d never spend the money themselves, but would absolutely enjoy every bite. How could they not? I never understood why people always lost their mind about pasta, until I had it here. It’s what dreams are made of. Reservations book weeks in advance… plan ahead. Second, Tavolata for happy hour is a feast. The ambiance is modern and chic, the kitchen wafts pan-seared meats of goodness, plus they serve a heaping bowl of Castelvetrano olives. This isn’t four-olives-in-a dish ($10??!!!) kind of spot. It’s a whole bowl. You’ll have left-overs. Ethan Stowell is a genius and I think we both subscribe to the idea that quality ingredients speak for themselves, evident in his honest Italian fare. He doesn’t take advantage of patrons, although he could, and you’d pay. Food is well priced and quality. All of his restaurants are amazing, but happy hour at Tavolata won’t break the bank on a Wednesday, and that’s worth writing about. Order the Mixed Salumi Board, a Big Green Salad and Octopus for bites. Then it comes, the Crispy Semolina Gnocchi. In a small cast-iron dish sit six baby-fist sized semolina balls, baked in marinara and laced with cheese. These are filling and heavy, but sweet jesus they are delicious. After a nice glass of red and a gaze onto Second Ave, which never disappoints, the middle of the week suddenly doesn’t seem so bad. Finally, for breakfast it’s all about Sunlight Café. I go here with my mom. It’s our place. 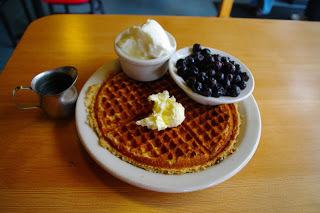 We order one sesame crunch waffle with blueberries, butter on the side; yogurt pancakes, extra blueberries and no butter; one scrambled egg (for me) and two cups of coffee. We then hand the menu back to the granola-ultra-natural-possibly-stoned waiter and enjoy our quality time. When the food arrives, without a word, she cuts her waffle in half; I do the same with my pancakes and we trade, half for half. Badabingbadaboom – we get the best of both worlds. The blueberry pancakes are a little salty and just sweet enough. Hot bursting blueberries, crunchy waffles and sesame seeds that get stuck in your teeth. Everything at Sunlight is homemade, plus they use only honey as a sweetener. It’s old and a little worn in, the dishes are throw-away. It feels like having breakfast at your crazy aunt’s house who doesn’t pay taxes.